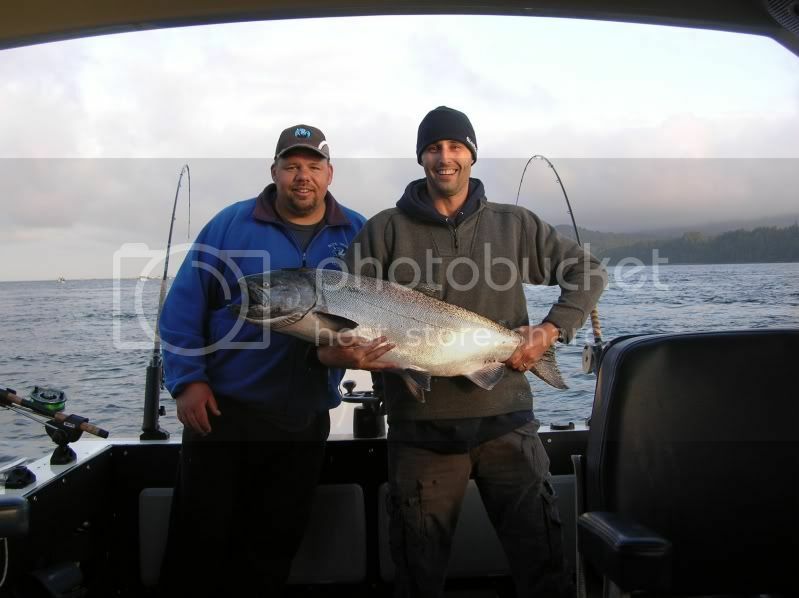 The fishing around Sooke has ranged from good to excellent lately. Last weekend, the Juan de Fuca Derby was a huge success, with over 200 salmon weighed in on the Saturday, and nearly 300 in total. That is close to triple the 2008 result...needless to say, this is proving to be a much improved year for salmon fishing off Vancouver Island's south-west coast. There was a tie for first place, two 36.2 pound tyees, both caught west of Sooke, one at Sheringham and one at Muir Creek. The winner was the one weighed in first. Below is a picture of Roy from Blue Wolf Fishing Charters with his fishing buddy Paul Taylor (from Trotac), a happy derby participant. Since the weekend, lots of reports of tyee salmon above 3o pounds. Many reports from Possession Point, Secretary Island, and towards Trap Shack. The coho have arrived, once you're in a school, there's reports of regular triple headers. They are still small, up to 10 pounds, but there's no shortage of action (just either bring a LOT of bait, or switch to artificial lures). They are both wild and hatchery salmon, so you can keep some potentially....smaller, but nice dinner fish. A few reports of pink salmon arriving too...this being an odd numbered year, they should be in thick in another couple of weeks. 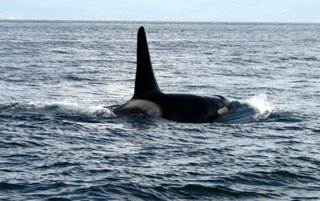 On another note, some very entertaining stories posted to the Sport Fishing BC forum about orca whales and salmon fishing. Below are a few excerpts, see the original thread for more...picture courtesy of Salty Towers Oceanfront Cottages. "Profisher: Started at the trap and hit a 20 before I even got the 2nd cannonball one the rigger. Lost another later, (sawed off leader) also 3 hatchery coho, then part of L pod showed up heading west. Ran to Sheringham and picked up a 15 on the first pass and another hatchery coho. Lost another spring just before the whales arrived again. Then the fun began. One of the other 2 boats there hooked a big fish. They fought it while the whales were passing by. I saw 3 females turn back to the east heading right for them. I knew what was coming. The 3 people in the boat saw it too and started to work the fish more aggressively to the boat. The flasher was up but the fish stayed about 10-15 feet away from the boat. The whales closed in. The guy holding the net started smacking the water with it trying to spook the whales. They got the flasher to within a foot or two of the rod tip but the fish was going nuts. The net guy tried a couple of times to snag it. The line and flasher went quickly towards the bow, I knew a whale had it. Then the line eased off and the net was quickly slipped under a 30+ pound spring. The female on board started yipping it up as they managed to land the big fish. They told me a few minutes later that the whale did have the fish in it mouth but it slipped out. They managed to net it before the whale could get turned around for a 2nd attempt. The 3 whales swam back and forth around their boat for a few minutes trying to find the fish. What a great thing to watch and what a story they have to tell!" "TheRock: That sounds like my experience 2 years ago at Otter, a pod of killer whales came right under our boat and at that moment we had a TRIPLE header on !! the pod kept going however the big male killer whale by him self turned back and came straight for one fish and grabbed it and came to the surface ! Rolling and splashing with the spring in its mouth. It was the most unbelievable experience I have ever seen! Here I am Fighting out a killer whale with the rod in my left hand!!! My right hand I have the net scooping my dads spring all on the same side of the boat and the third rod still in the rod holder as the third spring is zipping line offff!!!!!!!! An experience I will never forget.. we had 6 springs on by 7am !!! All in 30. Min. of fishing!!!!! (Kept four) I will never forget that trip.. a memory to last a life time. I look back and wish I had a third person on the boat that day with a video camera filming that morning.. If I did I would of put it on U-tube for every one to see..."
"FishFlyGuy89: Same story for me at aldridge 3 years ago, My dad had about a 15 pound spring on, no whales to be seen and then what happenes, out of nowhere a small female comes right up behind the flasher, my dad is fighting the fish, and he starts to horse it in only feet from the whales mouth and into the net and into the boat, the whale did one pass and then bolted out into the strait." Great fishing stories...like it's not already exciting enough just catching salmon!